10" deep top platform provide quality features for the everyday user. (standard on 2-step to 5-step models) Four spring loaded casters on 2-step to 5-step models. 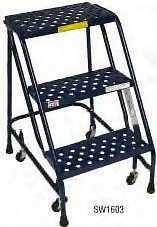 Casters retract when load is placed on the ladder, setting the ladder firmly in place on rubber tips. When the load is removed, springs push down the casters enabling the ladder to move about freely. coverage with no drips or runs. All ladders are painted blue with a premium powder paint. ** Ladders are shipped Knock-down to save on freight.